The GL1 is an Electromechanical Gate Lock was created for gates when weather resistance and security is most needed. It functions in both electrically and manually operated gate installations. Operates under pre-load up to 100 lbs. 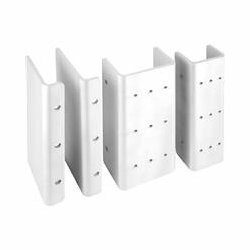 Designed mounting brackets for use with the M62FG Magnalock and GL1 Gate lock for a professional looking and high security mounting platform.